I happened to mention to someone that I was writing an article about the myths of Quetzalcoatl and the Virgin of Guadalupe. My Mexican friend became immediately incensed. “Myths? He yelped. Myths? Are you one of those people who don’t believe in the Bible?”. Bible? I thought as my jaw dropped open. What has the Virgin of Guadalupe have to do with the Bible? Instead, both the Virgin and the legend of Quetzalcoatl have to do with the effect of euro-centrism on the Mexican culture. Beginning with the landing of Cortez in 1519, alien Catholicism, with a white god and a white panoply of saints had been forcibly impressed on a confused people with a deeply religious background. 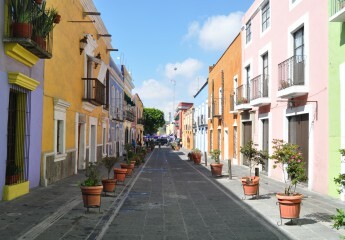 In 1531, Juan Diego made a pilgrimage to……. click here for the rest of the story. It was during the rainy season a number of years ago. 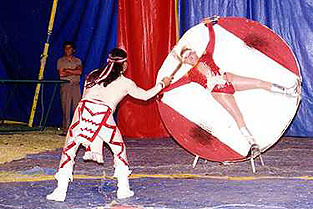 The Olguin Hermanos Circus was performing in a small Mexican village. Although the daily downfalls had been heavy, the tent and rigging were up and the show was going on. It seemed to Rafael Morales Alvarado that the water level in and around the big top was a couple of inches deep. As he came into the ring to perform the knife-throwing act he had been perfecting for years, he saw spectators sitting with their feet in deep puddles of water. Some of the lights had shorted out and the sound system was working erratically. He had given his hands an extra dousing of alcohol for its drying effect so as not to lose control of the knives and axes he hurls towards a large disc-shaped wooden panel with his wife attached to the middle of it whirling around in a circle. There were no accidents that day. The audience gave him one of his biggest ovations. He says that one of the rewards of being a circus performer is knowing the people in the audience are eager to see what the circus has to offer and receiving their demonstration of appreciation. Rafael is a true “cirquero”, having been born into the circus. He is forty-eight years old but looks younger. He is about five feet seven inches tall. When he comes out to perform he appears taller with black shoulder length hair that flows straight down the back of his neck over a headband, reminiscent of U.S. native American style. His parents and grandparents were also “cirqueros”. He met his wife twenty-five years ago in a small village where he was performing with the circus and they started a courtship. She was not of the circus. After they married, she went off with him and has been with him and the circus for the last twenty-three years. In addition to being part of the knife-throwing act, she sells snacks and trinkets before the circus begins and during the intermission. Three of their children also perform with the circus. Rafael, eighteen years old, and his younger brother Jesus, eleven, are trampoline artists. Their sister performs a gymnastic contorsionist act.